Habit at Kula, Maui, Hawaii, USA. September 16, 2006. Origin and Habitat: Canary Islands (Tenerife, Gran Canaria. La Patina), Cape Verde, Madeira, and locally in western Morocco, and introduced to the Azores. 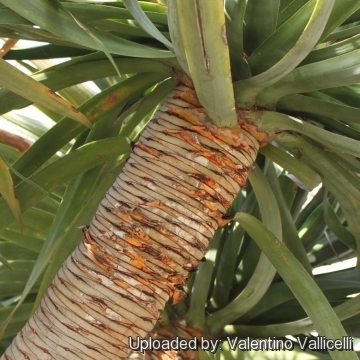 Dracaena draco var. 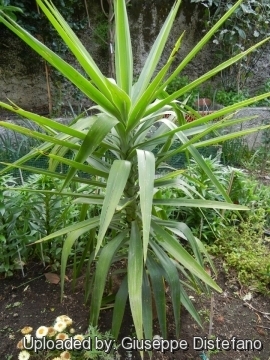 angustifolia Schult. 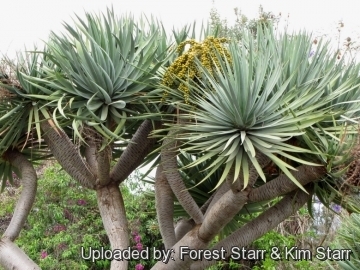 Description: Dracaena draco is a woody, evergreen tree monocot that can grow to about 10-15 m in height (but exceptionally up to 21 m tall and up to 15 m in circumference at the base of the trunk). Both trunk and branches produce large, compact clusters of silvery gray leaves. Generally has a large central trunk that with age may develop a number of side branches subtending a hugely wide semiglobose umbrella-shaped canopy. 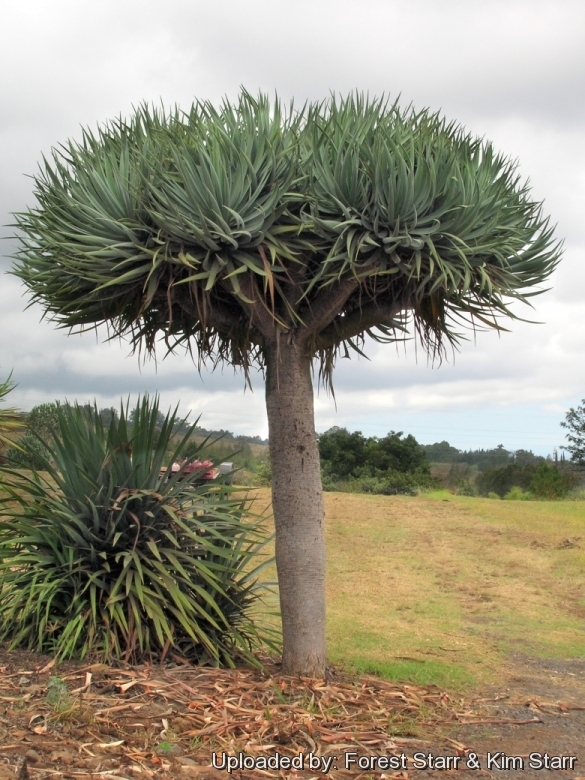 Not to be confused with Dracaena cinnabari, the Dragon Blood Tree native to Socotra. Trunk: Silvery-grey, smooth dichotomously branched. When young the stem is single. At about 10-15 years of age the stem stops growing and produces a flower spike. Soon a crown of terminal buds appears and the plant starts branching. Each branch grows for about 10–15 years and re-branches, so to determine its age one has to know roughly how often they flower, once every ten to 15 years (maybe more frequently in the Azores), and count the number of branches, so the age of the tree can only be estimated by the number of branching points before reaching the canopy. 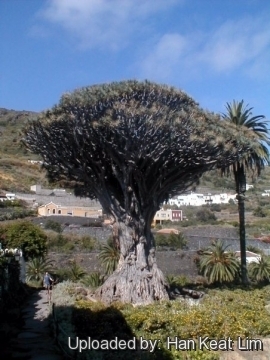 The specimen called "El Drago Milenario" (the thousand-year-old dragon) growing in north-west Tenerife is the largest and the oldest living plant of this species. Its age is estimated to be from 250 to 365 years old, not several thousand as had previously been claimed. Being a monocotyledon, it does not display any annual or growth rings. Leaves: Linear-lanceolate. Sessile, about 90-110 cm long and 4 cm wide, glaucous, silvery grey in compact rosettes at the apex of both trunk and branches. Inflorescence: Flower spike loosely branched (paniculate), within the foliage mass. Flowers numerous, lily-like, greenish-white or light yellow, sweetly perfumed, in groups of 4-5. Pedicels 5-10 mm long: Perianth white, pink, crimson to greenish-white, tube campanulate, 1,5-4 mm long. Tepals 7-11 mm long. Anthers greenish. Phenology: The plant blooms at intervals of about 10-15 years. After each flowering, the tree then branches. Fruits: Berries, globose, on average1-1,5 cm wide coral-red in clusters. Dracaena draco subs. ajgal Benabid & Cuzin: has smaller leaves and flowers. Distribution. Western part of the Anti-Atlas mountains of Morocco. 3) Chase, M.W. ; Reveal, J.L. & Fay, M.F. (2009), "A subfamilial classification for the expanded asparagalean families Amaryllidaceae, Asparagaceae and Xanthorrhoeaceae", Botanical Journal of the Linnean Society 161 (2): 132–136. 6) "Dracæna draco". New International Encyclopedia. 1905. 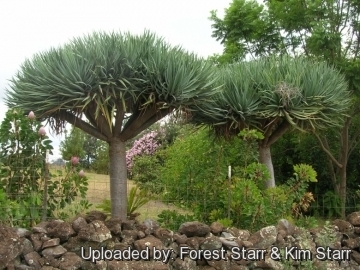 Cultivation and Propagation: Dracaena draco is very adaptable and widely available as an ornamental tree for parks, gardens. It will grow nearly anywhere in warm Mediterranean climates, but prefers hot, dry, nearly desert conditions. But young plant are happy growing indoors too. Growth rate: It grows slowly, requiring about ten years to reach 1,2 metres in height but can grow much faster. Hardiness: Some cold tolerance. This plant has tolerated temperatures down to –5ºC for very short period. However it can be difficult to get it to look its best without a good amount of heat and sun and so it is only really suited to the tropics (USDA Zones 9-11). Keep the plant cooler in winter, but maintain the light as bright as you can so that any growth which it may produce at this time will not be etiolated. It can be grown outdoors in the summer months to benefit from direct exposure to light, and especially exposure to high summer temperatures. Transplant: It is easily transplanted. 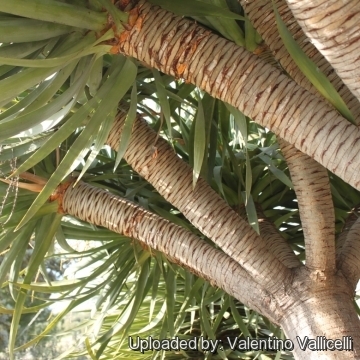 Garden uses: Not surprisingly, the extraordinary appearance of this tree has ensured it a place in parks and large gardens wherever there is a suitable Mediterranean climate. 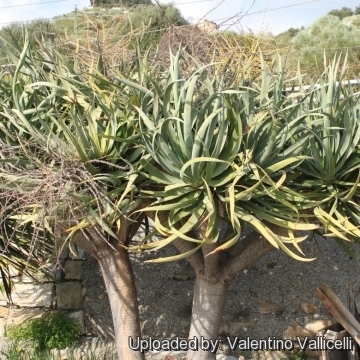 It is also cultivated as specimen plant, and as large container plant with dramatic grey foliage. It is very drought resistant but susceptible to frost. It makes a good house plants for a Dracaena, though recommend higher light if possible. Due to its drought tolerance it is used in sustainable landscape projects in arid region. Traditional uses: When the bark or leaves are cut they secrete a reddish resin, one of the sources of the substance known as dragon's blood, used to stain wood, such as of Stradivarius violins. 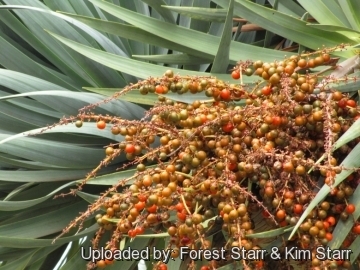 Dragon's blood was widely known in ancient times used as a dye, but this probably came from Dracaena cinnabanni of Socotra, and from Somalia. Other plants produce resins also known as dragon's blood and Daemonorops draco a palm from Sumatra, is the main source of the dragon's blood varnish for violins. It also has a number of traditional medicinal uses.